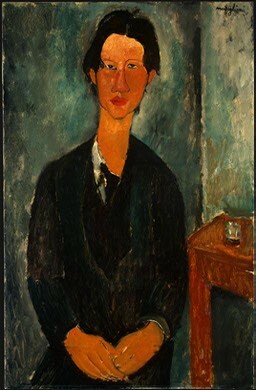 1917 Portrait of Chaim Soutine by Amedeo Modigliani, oil on canvas. Chaim Soutine was a French-Russian painter born in 1893 and raised in a small Jewish settlement near Minsk, Belarus. From a young age he expressed a strong interest in drawing. He was often faced with opposition from his mostly Orthodox community due to Talmudic proscriptions regarding images. At age 16 Soutine set off to study at the Vilna Academy of Fine Arts where he was exposed to a variety of artwork ranging from older Russian masters to artists of the Russian avant-garde. Soutine excelled quickly in painting and drawing as he began to develop his characteristic dark and twisted style. Soutine headed to Paris next to study under the respected French historical painter Fernand Cormon. Here he frequently visited the Louvre to conduct studies of works by Goya, Tintoretto, Ingres and Courbet, among others. Soutine most admired the paintings of Rembrandt van Rijn for his mastery of portraiture and still life as well as his dramatic rendering of light. Soon Soutine was introduced to Amedeo Modigliani, the Italian Jewish artist who influenced his career most significantly. The two became great friends. Soutine had always been a shy, slightly troubled man, so he struggled in forging relationships and further establishing his career. Modigliani helped him with this. He introduced Soutine to his art dealer, Leopold Zborowski, who almost immediately offered to represent Soutine. Ceret Landscape by Chaim Soutine, oil on canvas, 1920. 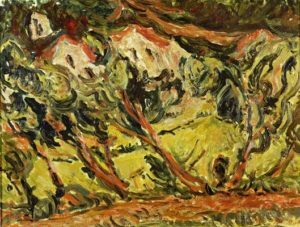 Soutine’s new-found art dealer enabled him to spend three years painting in Southern France where he created a series of distorted landscapes much like the two here at the Woodshed Gallery. Soutine’s paintings from this time depict elongated white houses with bright red roofs and turbulent skies. His anguished compositions are dramatically distorted. As an Expressionist, Soutine favored strong depiction of emotion over a convincing representation of depth and space. In House Portrait with a Woman, (below), Soutine features an almost haunting faceless form in a white dress standing beside a bare tree. 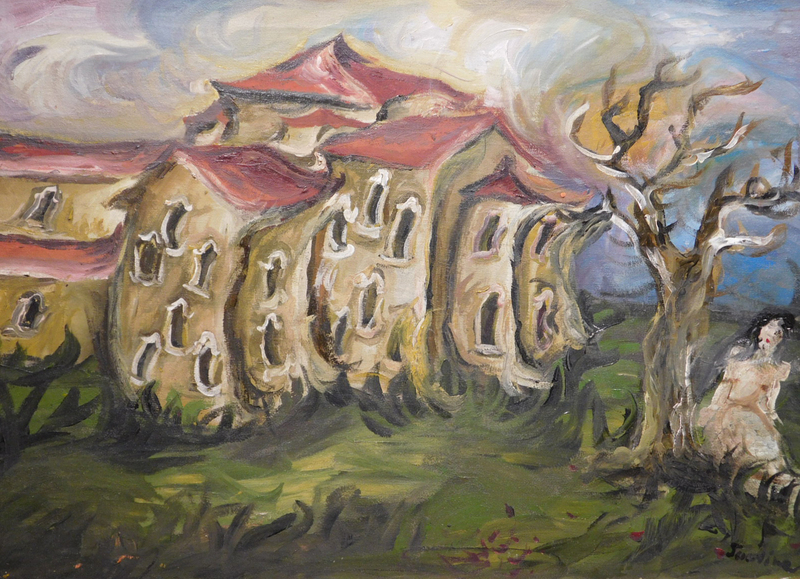 The house bends and sways along with the winds of the stormy skies above as if it is about to unhinge and float away. 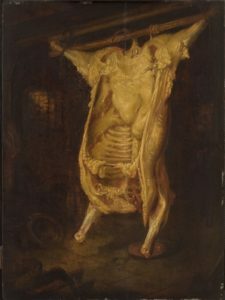 Another favorite subject of Soutine’s was animal carcasses. This interest was likely a result of his complex relationship with food as a Jew and of his adoration of Rembrandt, who painted many still lifes featuring food. 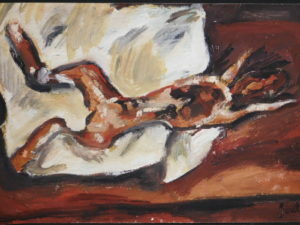 Soutine’s Rabbit Carcass (similar to Rembrandt’s Slaughtered Ox) depicts a dead rabbit sprawled on a table with its head chopped off. Soutine’s dark palette contributes to the disturbing mood of the piece. It is thought that the twisted, oppressive nature of Soutine’s paintings reflects the artist’s own inner turmoil. Nonetheless, Soutine paved the way for future members of the avant-garde. The influence of Chaim Soutine can be observed in the later works of many artists such as Jackson Pollock, Willem de Kooning and Francis Bacon.